SDG was honored to partner with Boys & Girls Clubs of San Francisco to create event graphics and marketing materials for their Annual Gala fundraiser, which raised over $2.5 million to benefit local youths and families. To visually represent the event theme, Pathways to Success, SDG designed artwork to resonate with the interactive projects, performances and artwork made by young people displayed throughout the event. 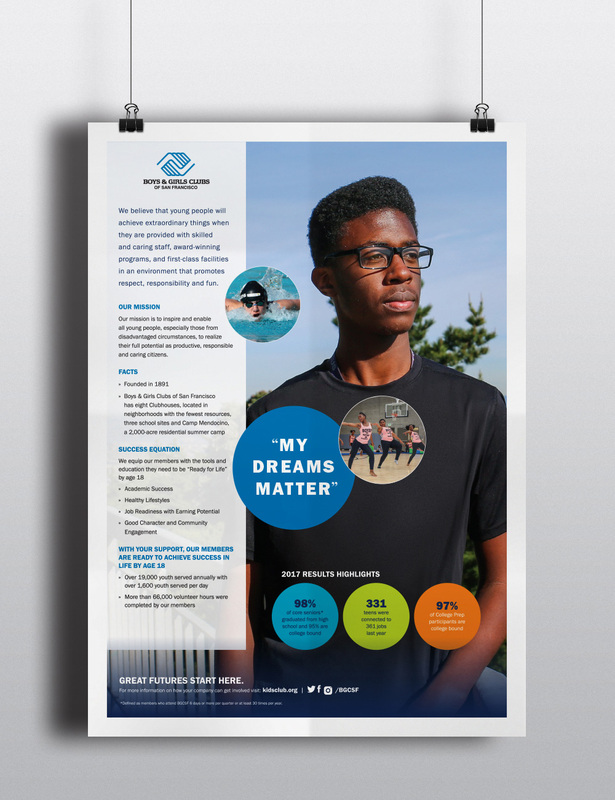 We have also created materials for the Boys & Girls Clubs of San Francisco Annual Golf Tournament and the Youth of the Year Awards Luncheon fundraising events, as well as their Annual Report and various ad campaigns. “The Club” serves over 1,700 youths across 12 locations daily, and we are inspired by their amazing work that empowers young people to realize their full potential as productive, responsible, and caring citizens.